To really get to know Key West and the Florida Keys, you simply have to get on a boat tour and head out to the famous Key West Back Country. This is what many call the heart of Key West, as it is home to the widest array of land, air, and marine species. With the Sail Snorkel Kayak tour package, guests get the chance to explore the delicate and beautiful coral reef gardens using snorkeling gear, followed by a kayaking expedition to the lush and diverse Mangrove Islands. When it comes to eco tours, the Sail Snorkel Kayak (and its sister tour, the full-day Back Country Safari) is the best way to get to know the "heart" of Key West! We run two Sail Snorkel Kayak trips daily, a morning trip and an afternoon trip. 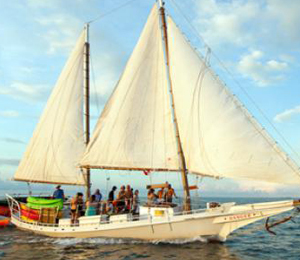 When you climb on board our authentic sailboat, you are starting a journey to the natural side of Key West as only we provide! Along your journey, you will see a wide variety of animal species, including those of the avian variety as well as marine creatures like colorful reef fish, stingrays, spiny lobster, and sometimes even sea turtles! Both snorkeling and kayaking are excellent ways to immerse yourself in the natural side of Key West, and both are easy, even for beginners! Our dedicated crew on board the Sail Snorkel Kayak will be on hand to show you the best ways to use your snorkel gear and to maneuver your kayak. We offer you very stable kayaks that are easy to maneuver for people of all ages and with all levels of kayaking experience. The Sail Snorkel Kayak also offers guests a delicious assortment of snacks including fresh fruit and chips and salsa. After you are done with all the activities, we will even offer you a refreshing drink of beer or wine. And, of course, we will have plenty of soda and water throughout the excursion. This tour is great for people of all ages and requires advanced reservations! Parking is available on the 400 block of Caroline Street, you must pay a fee in order to park there. I have been to the Bahamas many times, but Sail Snorkel Kayak is one of my favorite trips! It includes everything that everyone should do here. As a Bahamas veteran, I can say only the best about this experience!